A prominent American officer during the American Revolution, Brigadier General Francis Marion played a key role in the war's southern campaigns and earned the moniker "The Swamp Fox" for his exploits as a guerilla leader. His military career began with the militia in the French & Indian War during which he fought the Cherokees on the frontier. When the war with Britain began, Marion received a commission in the Continental Army and helped defend Charleston, SC. 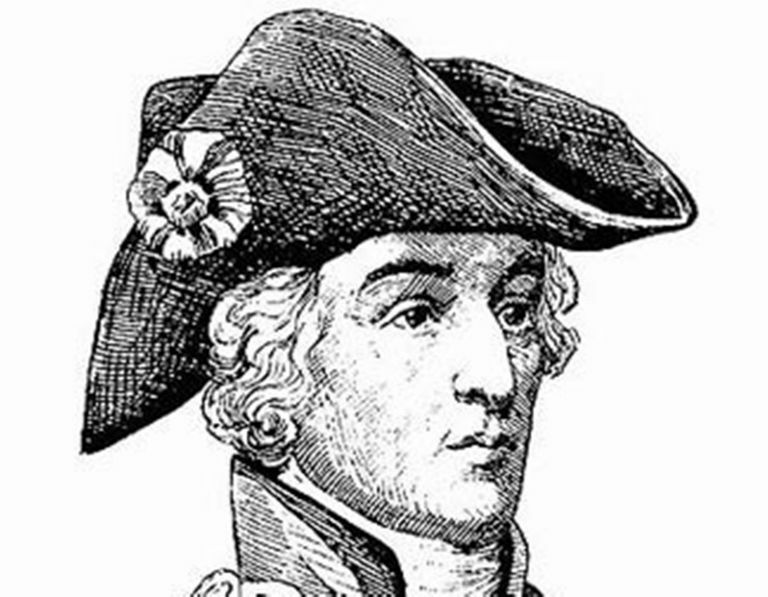 With the city's loss in 1780, he commenced a career as a highly effective guerilla leader that saw him employ hit and run tactics to win numerous victories over the British. Francis Marion was born around 1732 on his family plantation in Berkeley County, South Carolina. The youngest son of Gabriel and Esther Marion, he was a small and restless child. At age six, his family moved to a plantation in St. George so that the children could attend school in Georgetown, SC. At the age of fifteen, Marion embarked on a career as a sailor. Joining the crew of a schooner bound for the Caribbean, the voyage ended when the ship sank, reportedly due to being struck by a whale. Adrift in a small boat for a week, Marion and the other surviving crew finally reached shore. Electing to remain on land, Marion began working on his family's plantations. With the French & Indian War raging, Marion joined a militia company in 1757 and marched to defend the frontier. Serving as a lieutenant under Captain William Moultrie, Marion took part in a brutal campaign against the Cherokees. In the course of the fighting, he took note of Cherokee tactics which emphasized concealment, ambush, and utilizing terrain to gain an advantage. Returning home in 1761, he began saving money to purchase his own plantation. In 1773, Marion achieved his goal when he bought a plantation on the Santee River about four miles north of Eutaw Springs which he dubbed Pond Bluff. Two years later, he was elected to the South Carolina Provincial Congress which advocated for colonial self-determination. With the outbreak of the American Revolution, this body moved to create three regiments. As these formed, Marion received a commission as a captain in the 2nd South Carolina Regiment. Commanded by Moultrie, the regiment was assigned to the Charleston defenses and worked to build Fort Sullivan. With the completion of the fort, Marion and his men took part in the defense of the city during the Battle of Sullivan's Island on June 28, 1776. In the fighting, a British invasion fleet led by Admiral Sir Peter Parker and Major General Henry Clinton attempted to enter the harbor and was repulsed by Fort Sullivan's guns. For his part in the fighting, he was promoted to lieutenant colonel in the Continental Army. Remaining at the fort for the next three years, Marion worked to train his men before joining the failed Siege of Savannah in the fall of 1779. Returning to Charleston, he fortuitously broke his ankle in March 1780 after jumping from a second story window in an effort to escape a bad dinner party. Directed by his doctor to recuperate at his plantation, Marion was not in the city when it fell to the British in May. Following subsequent American defeats at Moncks Corner and Waxhaws, Marion formed small unit of between 20-70 men to harass the British. Joining Major General Horatio Gates' army, Marion and his men were effectively dismissed and ordered scout the Pee Dee area. As a result, he missed Gates' stunning defeat at the Battle of Camden on August 16. Operating independently, Marion's men scored their first major success shortly after Camden when they ambushed a British camp and liberated 150 American prisoners at Great Savannah. Striking elements of the 63rd Regiment of Foot at dawn, Marion routed the enemy on August 20. Employing hit-and-run tactics and ambushes, Marion quickly became a master of guerilla warfare using Snow Island as a base. As the British moved to occupy South Carolina, Marion relentlessly attacked their supply lines and isolated outposts before escaping back into the region's swamps. Responding to this new threat, the British commander, Lieutenant General Lord Charles Cornwallis, directed Loyalist militia to pursue Marion but to no avail. Additionally, Cornwallis ordered Major James Wemyss of the 63rd to pursue Marion's band. This effort failed and the brutal nature of Wemyss' campaign led many in the area to join the Marion. Moving sixty miles east to Port's Ferry on the Peedee River in early September, Marion soundly defeated a superior force of Loyalists at Blue Savannah on September 4. Later that month, he engaged Loyalists led by Colonel John Coming Ball at Black Mingo Creek. Though an attempt at a surprise attack failed, Marion pressed his men forward and in the resulting battle were able to force the Loyalists from the field. In the course of the fighting, he captured Ball's horse which he would ride for the rest of the war. Continuing his guerilla operations in October, Marion rode from Port's Ferry with the goal of defeating a body of Loyalist militia led by Lieutenant Colonel Samuel Tynes. Finding the enemy at Tearcoat Swamp, he advanced at midnight on October 25/26 after learning that the enemy defenses were lax. Using similar tactics to Black Mingo Creek, Marion split his command into three forces with one each attacking from the left and right while he led a detachment in the center. Signalling the advance with his pistol, Marion led his men forward and swept the Loyalists from the field. The battle saw the Loyalists suffer six killed, fourteen wounded, and 23 captured. With the defeat of Major Patrick Ferguson's force at the Battle of Kings Mountain on October 7, Cornwallis became increasingly concerned about Marion. As a result, he dispatched the feared Lieutenant Colonel Banastre Tarleton to destroy Marion's command. Known for laying waste to the landscape, Tarleton received intelligence regarding Marion's location. Closing on Marion's camp, Tarleton pursued the American leader for seven hours and across 26 miles before breaking off the pursuit in swampy territory and stating, "As for this damned old fox, the Devil himself could not catch him." Tarleton's moniker quickly stuck and soon Marion was known widely as the "Swamp Fox." Promoted to brigadier general in the South Carolina militia, he began working with the new Continental commander in the region, Major General Nathanael Greene. Building a mixed brigade of cavalry and infantry he conducted a failed attack on Georgetown, SC in conjunction with Lieutenant Colonel Henry "Light Horse Harry" Lee in January 1781. Continuing to defeat the Loyalist and British forces sent after him, Marion won victories at Forts Watson and Motte that spring. The latter was captured in conjunction with Lee after a four-day siege. As 1781 progressed, Marion's brigade fell under the command of Brigadier General Thomas Sumter. Working with Sumter, Marion took part in a fight against the British at Quinby's Bridge in July. Forced to withdraw, Marion split from Sumter and won a skirmish at Parker's Ferry the following month. Moving to unite with Greene, Marion commanded the combined North and South Carolina militia at the Battle of Eutaw Springs on September 8. Elected to the state senate, Marion left his brigade later that year to take his seat at Jacksonboro. Poor performance from his subordinates required him to return to command in January 1782. Marion was re-elected to the state senate in 1782 and 1784. In the years after the war, he generally supported a lenient policy toward the remaining Loyalists and opposed laws intended to strip them of their property. As gesture of recognition for his services during the conflict, the state of South Carolina appointed him to command Fort Johnson. Largely a ceremonial post, it brought with it an annual stipend of $500 which aided Marion in rebuilding his plantation. Retiring to Pond Bluff, Marion married his cousin, Mary Esther Videau, and later served at the 1790 South Carolina constitutional convention. A supporter of the federal union, he died at Pond Bluff on February 27, 1795.